You can never have too many monochrome pieces in your wardrobe and this Poppy Lux harlequin-print dress is a just another way to wear the trend. At first I thought the sleeves would be a bit of an odd length but I quite like it. It also makes the dress slightly more wearable for those winter nights out although you definitely cannot get away with bare legs - oh it is just too cold for that. 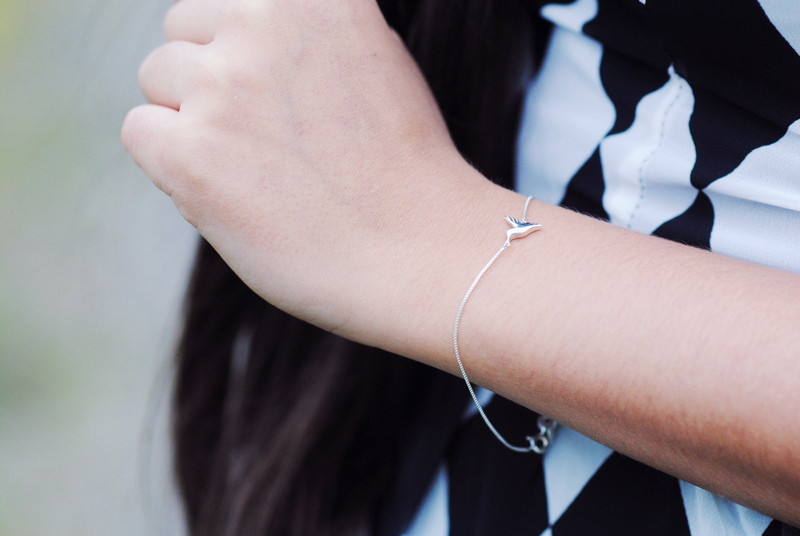 Since the print is quite loud, a dainty piece of jewellery, like this hummingbird bracelet from Jana Reinhardt, will probably be enough to complete the look. I have kept it quite casual in terms of accessories but you can certainly jazz it up with a statement necklace for a ladies night out. PS, you can get £20 off any full-priced item from Jana Reinhardt with the code blogger20 - if you still have a Christmas present to by you should check out the jewellery. It is so pretty and delicate!